Horologium, solo naturae motu, atque ingenio, dimetiens, et numerans momenta temporis, constantissime aequalia. You can download this magazine article to read off line as a free EBOOK. The escapement is a feedback regulator that controls the speed of a mechanical clock. The first anchor escapement used in a mechanical clock was designed and applied by Robert Hooke (1635-1703) around 1657, in London. Although there is argument as to who invented the anchor escapement, Robert Hooke or William Clement, credit is generally given to Hooke. Its application catalyzed a rapid succession in clock and watch escapement designs over the next 50 years that revolutionized timekeeping. In this article, I consider the advances this escapement design made possible and then describe how horologists improved on this escapement in subsequent designs. Before continuing, it is important to stress that the development of the escapement by generations of horologists was largely an empirical trial-and-error process. As will be seen, this process was remarkably successful despite being based on only an intuitive understanding of physics and mechanical engineering principles. Even today, the understanding of the dynamics of linkages under impact, friction, and other realistic effects, is incomplete. Consequently, the explanations I give in this article, concerning the evolution and operation of the clock escapement, are based largely on kinematic, geometric, and energy transfer principles. An escapement mechanism is a speed regulator, and it uses feedback to obtain precision operation despite imperfect components. The presence of feedback is realized by the interaction between the escape wheel and the escape arm, which interact according to their relative position and velocity. This interaction can be seen in Figures 1 and 2, where the verge-and-foliot escapement, one of the earliest escapements, is analyzed. It is with this escapement that I begin this description of the evolution of the anchor escapement. The earliest record of a mechanical clock with an escapement, which is believed to date around 1285, was a reference to a payment for a hired clock keeper at St. Paul’s in London. 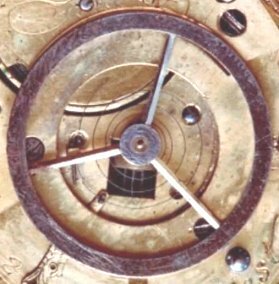 All the early mechanical timepieces are believed to have had a verge and foliot as the control mechanism for measuring the passage of time. The verge-and-foliot design was clearly based on the alarum (the alarm mechanism, with a hammer and a bell instead of a foliot), which was invented several centuries earlier. No one knows exactly when the mechanical clock was invented or by whom. First, let us consider a clock consisting of a set of gears and a driving weight, using the force of gravity (see Fig. 1). In such a clock, the gears would spin uncontrollably unless a control mechanism were applied at the other end of the gear train. The control mechanism consists of an oscillating device that prevents the gear train from rotating, except at specific intervals, when it releases one tooth of the last gear in the train. By controlling the rate of rotation of the gears, it is possible to use this device to measure time by incorporating an indicator and a scale at the end of the shaft of one of the gears. Fig. 2: An early clock. The verge-and-foliot control mechanism consists of a shaft, called the verge, and a crossbar with a weight attached at each end, called the foliot (Fig. 2). The weights can be moved to different positions on the crossbar, so that the radius (or distance) of the weights from the center determine the period of oscillation. The control mechanism is an escapement because the energy is allowed to "escape" each time a gear tooth is released. The stored energy of the system is the potential energy of the driving weight, which falls slowly during operation. In early clocks, the driving weight could weigh as much as 1,000 lb, and large towers were constructed to accommodate its range of motion. It is important to understand how the verge escapement works to appreciate the circumstances that led to the invention of the anchor escapement. The oscillator consists of the foliot, suspended at its center by a string, often made of silk. For the foliot to oscillate, accelerating and decelerating forces must be acting on it. When a tooth of the escape wheel escapes, this wheel rotates freely by about 2º (called drop) until another tooth strikes an arm protruding from the vertical shaft that is attached to the crossbar. The vertical shaft has two arms, called pallets, located with about 100º of angular separation and with a vertical separation equal to the diameter of the escape wheel. The pallets rotate by about 100º until a pallet releases an escape tooth. An instant later, another escape tooth strikes the other pallet. As the pallets rotate, the escape tooth slides across the surface of the pallet, exerting a force on it. The work done on a pallet is therefore the applied moment times the arc through which the escape tooth moves during contact, and it is this moment that causes the foliot to accelerate and rotate in one direction. In horology, the moment applied during contact is traditionally called impulse, although the applied torque is not necessarily impulsive in the usual engineering sense. After another tooth strikes the other pallet, the foliot continues to rotate in the same direction (as it was rotating in before the tooth struck the other pallet), causing the other pallet to push the escape wheel backward as the foliot rotates. Since the escape wheel exerts a force on the pallet, the pushing of the escape wheel backward causes a decelerating force, which is opposite and equal in magnitude, to act on the pallet until the foliot stops. This backward action, called recoil, is equivalent to winding the clock by a small amount; in other words, energy is stored rather than wasted. After the foliot has stopped, it changes direction, since the escape wheel continues to exert a force on the pallet, and the foliot begins to accelerate in the opposite direction, continuing to do so until it has rotated by about 100º and the pallet allows the tooth to escape again. The escape wheel rotates freely again by about 2º until another tooth strikes the other pallet again. This process is repeated indefinitely. Since it was difficult to control many of the factors that affected the period of oscillation of the foliot, the early clocks were poor timekeepers, with errors exceeding several hours per day. The greatest problems were caused by changes in temperature and levels of friction. When the temperature increases, the crossbar becomes longer due to the thermal expansion of the wrought iron, so the period increases, and so the clock loses time. Similarly, the clock gains time in colder temperatures. The first modification of the verge-and-foliot clock was the replacement of the foliot weights with a wheel in smaller (non-church) clocks. By distributing the weight evenly around the perimeter of a circle, the foliot design was made more aerodynamic. More importantly, changes in temperature had less effect on timekeeping. In warmer temperatures, the crossbar expanded, causing the circle to become distorted, rather oval-shaped. This means that, although part of the circle had a greater diameter than before (causing the clock to lose time), other parts of the circle were pulled in and had smaller diameters than before (tending to make the clock gain time and partially offsetting the effect of time loss). This could be seen as a crude form of temperature compensation. The wheel, or metal ring, that replaced the foliot is called a balance wheel, and it was introduced around 1400. The foliot continued to be used as well, however, until around 1650. Another modification was the replacement of the weight with an elastic steel ribbon, called the mainspring. Its introduction around 1500 by Peter Henlein (1480-1542), a locksmith from Nürnberg, is most significant because it made possible the production of smaller and portable clocks (or very large pocket watches). It was extremely difficult to make a steel ribbon by hand with the production methods available at that time. Mainsprings were relatively short and did not provide constant power. Power levels were high when the clock was fully wound, decreasing gradually as the mainspring unwound. Early spring-driven timepieces were extremely erratic timekeepers because they gained time drastically at the beginning of the wind, and lost time drastically toward the end of the wind. Several devices were designed to improve the moment-versus-angle curve of the mainspring, but the spring-driven timepiece always remained an inferior timekeeper, compared to an equivalent weight-driven timepiece. A major improvement was the use of brass in clocks and watches, beginning around 1560. Although the production of brass can be traced back to Roman times, it was scarce before 1500, and more so in England than on the European continent. The use of brass in making timepieces increased as it became more available. Brass is an alloy of about 60% copper and 40% zinc. Its properties, especially its resistance to corrosion, make its use very beneficial. The corrosion of iron products has always been a major problem. Surfaces affected by corrosion lose their smoothness, increasing friction. Corrosion is accelerated by the abrasive action of iron oxide mixing with the lubricants. By fabricating the rubbing surfaces of dissimilar metals, the coefficient of friction can be reduced considerably. The reduction of friction has to do with the lattice structure of the metal atoms. When the lattice structures are different, the two surfaces do not fit together perfectly, and so there is less surface contact between the two rubbing surfaces and hence less friction. Brass-with-iron (or steel) has a much lower coefficient of friction than iron-with-iron or brass-with-brass. Adding a few percent of lead to the brass alloy also reduces friction levels, making the brass surface self-lubricating to some extent. The main reason brass resists corrosion is that the surface develops a layer of copper and zinc oxides (mainly zinc oxide, since zinc is more reactive than copper), protecting the metal underneath. In very humid conditions, zinc carbonate and, sometimes, copper sulphate can form, with the zinc carbonate providing a protective layer. Iron oxides do not protect the iron metal underneath, so corrosion can continue unabated, particularly in humid conditions. Clocks made of iron and brass parts were considerably more durable than those made entirely of iron. The parts that would experience more severe wear were made of iron (they were later made of steel), and those that would experience less wear were made of brass. The larger gears were therefore made of brass, but the smaller gears (called pinion gears) were made of iron. The escape wheel was made of brass, but the pallets were made of iron. Brass is also softer than iron, so brass parts are easier to make, a very important point in an age, before the Industrial Revolution, when all parts were made entirely by hand. The first clock to use a pendulum instead of a foliot or balance wheel was produced by the Dutch mathematician, Christian Huygens, in 1657 (although it is claimed that others invented the pendulum clock before he did). His clock was a considerably better timekeeper than any clock before it, the reason for which is actually quite simple. Every escapement needs a driving force, provided by a suspended weight, and a restoring force, which makes the timekeeping device (i.e., the pendulum, balance wheel, or foliot) change direction. In previous designs, the only restoring force was recoil. As discussed earlier, a lot of recoil action was needed, and it created a lot of friction. Huygens’ clock, however, used both recoil and the force of gravity as restoring forces. If the lubricants failed and there was a lot of friction between corroded pallet and escape wheel tooth surfaces, the force from the escape wheel may not be enough to cause the foliot to change direction once it stopped. Therefore, the verge-and-foliot clocks were unreliable. In the pendulum clock, the pendulum could be seen as wanting to change direction and return to a downward position because of gravity. Pendulum clocks were more reliable and much more consistent as timekeepers. Many of the earliest pendulum clocks had very wide pendulum swings because of the verge escapement. Early pendula were short and light to minimize the amount of energy needed to keep them in motion. Furthermore, the wide swing, combined with changing conditions, such as increased friction and drying of the lubricants, caused changes in the angle of swing and resulted in variations in timekeeping because of a phenomenon called circular error by horologists. This error is caused primarily by the fact that the restoring effect of the gravitational force increases as the sine of the angle of swing. The restoring force causes the period of oscillation to decrease as the amplitude increases. Since the verge escapement had a very wide pallet swing, a new escapement design was required. As mentioned earlier, Robert Hooke invented the first anchor escapement around 1657. The date is only approximate, the important point being that the anchor escapement was invented soon after the pendulum clock, perhaps even in the same year. The anchor escapement has several advantages over the verge escapement, the most important of which is a much smaller angle of swing. The anchor is a steel lever with two limbs, called pallets, rotating about a pivot shaft. The two pallets have impulse faces that interact with the escape wheel’s teeth. Instead of requiring a pendulum swing of about 100º, the anchor escapement reduces the pendulum swing to as little as 6º, requiring much less energy to keep it in motion. The pallets of the anchor escapement are positioned much farther away from the axis of rotation, thereby requiring a much lower angle of rotation to obtain the same arc. Less driving weight means less friction in the bearings of the gears, less friction between the gear teeth, and less friction between the brass escape wheel teeth and the iron pallet surfaces. A smaller swing made it possible to use a much longer and heavier pendulum. A longer pendulum reduces wear in the escapement. Although a heavier pendulum entails more friction, it has more angular momentum, and thus its motion is less affected by interaction with the escape wheel. Therefore, a long and heavy pendulum has a swing that more closely resembles simple harmonic motion, despite contact with the escape wheel. Energy transfer and recoil take place in the same manner as for the verge escapement. The anchor escapement allowed new designs for the escape wheel and pallets that were much easier to manufacture. The ability in the 19th century to mass-produce rough copies of pallets and escape wheels that could easily be fitted and finished by the clockmaker substantially reduced the overall cost of producing a quality clock. The design principles were remarkably simple. The escape wheel teeth needed to be tall and pointed, and they needed to be tapered to maximize strength. A shape such as a right-angled triangle could be used, although many designs had a curved front side and a straight back side, as shown in Fig. 3. The height of the teeth and the spacing between them needed to be such that the pallets could enter the space far more deeply than they did under normal running conditions (with a typical amplitude of oscillation of about 10°); in other words, there needed to be plenty of clearance. The radial length of each tooth (i.e., the distance from the center of the escape wheel to the tip of each tooth), as well as the angle between each pair of teeth, needed to be identical. A tooth that was too short, or unevenly spaced teeth, resulted in irregular action of the escapement, detrimentally affecting timekeeping. Figure 3: The Recoil Escapement. The design of the pallets was similarly straightforward. Of critical importance was the impulse face. The angle of each impulse face was such that the desired angle of swing of the pendulum was achieved between the pallet’s point of contact with the escape tooth and the point at which it released the tooth. In other words, if a wider swing was desired, the clockmaker created a steeper angle on the pallet. If a smaller swing was desired, the clockmaker created a shallower angle on the pallet. Another issue in pallet design was symmetry. Each pallet must cause the pendulum to swing by the same angle. Each pallet must therefore have the same steepness or shallowness; otherwise, the effect of the pallets would be asymmetric. Timekeeping is improved as the actions of the pallets are increasingly equalized. The distances from the midpoint of each pallet impulse face to the axis of rotation of the pallets need to be the same; or else the actions would be asymmetric. The weight of the pallet assembly (two pallets plus two pallet arms) needs to be as low as possible. The other details of the pallet’s design could be created as the clockmaker desired, and there are many different styles of this escapement. An example of one style is shown in Fig. 3. Most clocks with anchor escapements have pallets that were designed as outlined above. However, a few clock designs demonstrate the superior knowledge of the clockmaker, especially with regard to the energy transfer efficiency of the escapement. For the force applied by the escape tooth on the pallet at the point of impulse to be applied at a right angle to the force received by the pallet at its point of impulse and in its direction of motion at that point, the angle of the pallet impulse face must lie at a right angle to a line that lies half way between the two force vectors (in this case, at 45º). This geometry was needed to maximize the transfer of energy from the escape wheel to the pendulum. Clockmakers needed to understand vector analysis, at least intuitively, to design an escapement with maximum efficiency. In about 1660, Robert Hooke discovered his law of elasticity, which states that, for relatively small deformations of an object, the deformation is proportional to the applied force. Hooke applied a spring to the balance wheel of a watch with a verge escapement. This balance spring, made of tempered spring steel, was straight. However, a spiral form, which we now know as the hairspring, was developed simultaneously by Christian Huygens and the Abbé d’Hautefeuille. The hairspring was thin and relatively short, although adequate for use with the verge escapement because the angle of swing of the balance wheel was about 100º. The addition of the hairspring dramatically improved the timekeeping and reliability of the watch because the hairspring stored elastic energy to act as the restoring force. This restoring force brought the balance wheel back to the midpoint of its oscillation and thus allowed it to change direction and to oscillate back and forth. The hairspring caused the action of the balance wheel to resemble simple harmonic motion more closely than before. Adding a hairspring to a balance wheel or to a foliot dramatically improved the timekeeping and reliability of the watch or clock. Fig. 4 shows a balance wheel and hairspring from an English pocket watch, circa 1820. The hairspring is typical of earlier hairsprings, with a few coils. A flat suspension spring, which is a thin sheet of elastic spring steel, similarly benefited a pendulum clock with either a verge or an anchor escapement. This is particularly true for an anchor escapement because of the narrow swing of the pendulum. A narrow swing means that the returning force (which is proportional to the sine of the swing angle) caused by gravity is small. It also means that the pendulum requires much less weight to keep it oscillating, compared to an identical pendulum with a wide swing, so there is less recoil. If the returning forces caused by gravity and recoil were small, then most of the force that acts to change the direction of the pendulum would be caused by the elasticity of the suspension spring. The energy is not lost in friction or stored as gravitational potential energy. It is stored as elastic energy instead. Furthermore, virtually no energy (save for that lost to internal heating) is lost at the axis of rotation of the pendulum, compared to other forms of suspension that involve sliding friction. Since the advent of the suspension spring around 1660, virtually every quality clock made with a pendulum has been equipped with a suspension spring. The importance of the suspension spring increased when the anchor escapement was modified to eliminate recoil action. In 1715, George Graham (1673-1751) of London is said to have modified the anchor escapement to eliminate recoil, creating the deadbeat escapement, also called the Graham escapement. This has been the escapement of choice in almost all finer pendulum clocks since then. Graham modified the arm of each steel pallet so that the lower portion of each limb was based on the arc of a circle with its center at the axis of rotation of the pallets (see Fig. 5). The tip of each limb had a surface, the angle of which, based on force directions (as outlined above), was designed to provide an impulse to the pallet as the escape tooth slid across the surface of each tip. The escape tooth strikes the pallet above the tip on the lower portion of the limb (see Fig. 6), where the escape wheel is rotating clockwise and is about to strike the entrance pallet on the left side, above the impulse face. The surface that the escape tooth strikes is the locking face, since it prevents the escape wheel from rotating farther. When a pallet releases an escape tooth, the escape wheel rotates freely with about 2º of drop, until another tooth strikes the other pallet on its locking face, just beyond the tip. If the pendulum continues to swing after the drop has taken place, the escape tooth slides up the locking face until the pendulum stops. The escape wheel is not pushed backward (recoil) as the tooth slides up the locking face because each point along the locking face is at the same radial distance from the axis of rotation (pivot shaft) of the pallets. The pendulum stops at the end of each swing, to some extent because of gravitational force but mostly because of the elasticity of the suspension spring, which serves to change the direction of motion of the pendulum and start it moving again. The pendulum would behave similarly, however, if recoil were present. Recoil interferes with the action of the pendulum and causes it to stop sooner, reducing its amplitude of oscillation. It is preferable to minimize interference in the action of the pendulum to exploit the natural pendulum dynamics. The escape wheel teeth in a Graham escapement are slightly different from those in a recoil escapement. In the Graham escapement, the teeth lean forward, in the direction of rotation of the escape wheel, to take advantage of the curved locking faces of the pallets and thus achieve no recoil. In the original recoil anchor escapement, the teeth may lean backward to avoid being at right angles to the pallet surfaces and reduce the risk of accidental damage to the tips of the teeth. Which way the teeth lean, however, is less important than the clearance they provide to allow the pallets to enter between teeth as the pallets swing in and out. The energy that the escape wheel provides to the pendulum is needed to maintain the motion of the pendulum. The clock is not self-starting. You must start the pendulum swinging. The anchor escapement is not self-starting since the energy that is transferred from the escape wheel to the pallets is only sufficient to overcome the effects of friction, but it is not sufficient to make the pendulum start oscillating. In contrast, the verge-and-foliot escapement is self-starting.